Nem has enough chaos in Holger I mean, they're a fun item, but she wouldn't use them. Also, did we settle for a group name back when we last discussed it? Wasn't the last suggestion something like "Ulmwin the amazing and his backup dancers" ? I feel something aimless / chaotic would sum up our little group quite nicely given how we seem to be utterly without any kind of plan or ability to ignore a side quest. That kind of suggestion WOULD be in keeping with Holger's ego. I suspect he'd get pelted with scones if he made it IC though. And all I'm saying is almost everyone has gotten more magical after meeting Holger! Now that's just a waste of perfectly good scones! Ulmwin would just eat them all so Holger can't have any more. ...He's already doing that, but that's besides the point. That is true that we're all magical now I think. We need wears to come and save us with a pun haha! I keep running into a brick wall on naming. Everything I think of sounds like a heavy metal rock band. Or an outlaw bike gang. Haha! Right? I'm reals bad at naming stuff. Mobocracy? It WOULD describe our group pretty well. Ooohh, want the bracers too. Be great to always have the two hand option. He probably should at least get a shield now he's got a crossbow he can fire from one hand, too. You mean Wand of Wonder? Bracers of Defense to stack with mage armor, as they provide a +2, rather than providing a way to calculate AC. Mage armor has "armor" in the name, but it isn't armor, armor, in much the way that shield isn't a shield, shield. As far as crafting, I don't have the XGtE in front of me which has some revised crafting rules, but believe the base maximum progress is 5 gp/person/day (with potions and other consumables having their own rules). The following are my musings based on that recollection. 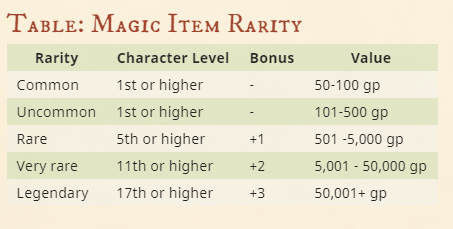 A bit annoyingly, 5e only gives price ranges based on rarity (a combination of low magic item setting and giving DMs the final say), rather than a completely priced out table like the adventuring gear in the PHB. The Bracers of Defense are considered "rare", and thus would fall in the 501-5000 gp range, and definitely closer to the top of that range than the bottom. The "Sane Magical Prices" document prices them at 6000 gp (the +2 AC bonus is quite good for a "rare" item, as +2 bonuses would generally not show up until "very rare", but putting it at "rare" makes it available sooner to those who would want to use it, which would be classes/builds where that +2 AC bonus isn't going to make them untouchable at those levels due to the restrictions of the item. So, even though I'd price it closer to the top end of the "rare" range, at 5 gp/day, Holger is looking at 100-1000 days of downtime work to construct bracers of defense. Of course, that is 5 gp/person/day, so if you have multiple people working on something, they can each do 5 gp worth of work. Constructing something like bracers would require proficient use of artisan tools (smith, leatherworker, jeweler, tinkerer? ), so you could possibly get proficient party members to contribute time and effort, or pay skilled NPCs to do the work as well. If you have another helping, that halves the time to 50-500 days for a "rare" item, and if it's something that three people could conceivably work on at the same time, you're down to 34-334 days. Teams of 4 working on a project would probably only be for things that are large enough or have enough parts that they could do so without getting in each other's way, but that gets you down to 25-250 days. At the upper end of that range, Holger'd be looking at the better part of three years to make that solo. Additionally, you need to know HOW to make it. DMG wrote: ... To start, a character must have a formula that describes the construction of the item. Their character must also be a spellcaster with spell slots and must be able to cast any spells that the item can produce. So for something like the wand of wonder, you'd need the formula/recipe/blueprints, as well as being able to cast all of the spells it produces (or hire someone who can). I don't recall how often spell slots must be expended during the creation, but I believe that is part of it too. I seem to recall there being some sort of necessary component that the DMG suggests be the basis of a quest in order to procure it for the crafting of the item too. TL;DR: There are lots of hoops to jump through with crafting, but I'm willing to work with you/them to see what we can do, but for the most part, it's a down time, longer term project. Maji also has low defense, sometimes even less than Ulmwin! And he's a melee fighter. (I also want bracers of defence.) Though, Amulet of health would also be good. Ring of featherfalling would be useful once he gets flying beasts unlocked, because otherwise he may accidently die after getting transformed back while in midair. I'm sure there are other goodies he may want as well but I shouldn't be too bothersome. Randy has to be careful about defense since he's going to multiclass into a couple of groups that penalize armor above leather. He should get to the point where he doesn't need much in armor. Now ability to hit/do damage...that Randy could still use help with. Best defense is a good offense. Randy has to be careful about defense since he's going to multiclass into a couple of groups that penalize armor above leather. If you're still thinking monk, even leather is an issue. Doesn't penalize you exactly, but a lot of monk features are not available if you're wearing armor of a shield. Unarmored Defense is just an alternate way to calculate your AC, you can only use one at a time. Randy currently has AC 16 without his shield and AC 18 with it. If you go monk, you'd still have those numbers if you choose to wear it, or take them off and have AC 16. If as a monk calculating with Unarmored defense, you pick up a shield and try to use it, you actually drop to AC 15. Unarmored Movement only adds to your base movement speed when unarmored. Martial Arts is only available when unarmored, so if you want to be able to make unarmed strikes as a bonus action, you can't be wearing armor. Of course, by the point of multiclassing, you're working with more HP, and have other options as well, so that AC 16 instead of 18 may very much be worth shedding the armor to pick up speed and extra hits. Meeting from 8-10 AM CST. Then busy the rest of the morning to make up for the meeting.